MIAMI (AP) — Jake Arrieta’s 100th career victory left him in a mood to look back — and ahead. “On to 200,” the 33-year-old right-hander said. 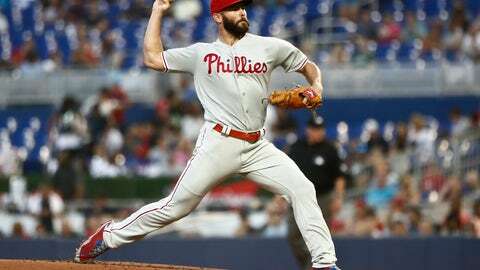 That sounds good to the Philadelphia Phillies, who benefited from Arrieta’s seven-inning effort Friday to send the Miami Marlins to their fifth consecutive loss, 9-1 on Friday night. He’s the 18th active pitcher to reach the victory milestone. Arrieta took a 6-0 lead into the seventh, when Miami ended a streak of 21 consecutive scoreless innings on Austin Dean’s sacrifice fly. The Marlins have lost nine of their past 10 games, and they’ve been outscored 30-2 in the past four. Manager Don Mattingly said Arrieta a big factor in the latest feeble offensive effort. The Phillies’ J.T. Realmuto hit into a double play with the bases loaded to end the first inning, but finished with two hits, two runs and an RBI. He made a nifty headfirst slide to score from third on a bloop single in the fifth. The game was Realmuto’s first at Marlins Park since Miami traded him in February. Andrew McCutchen had three hits, including a three-run homer in the eighth. The Phillies’ leadoff hitter set the tone in the first inning by going from first to third on a single to left.